This Open Box product is available in limited quantities while supplies last. 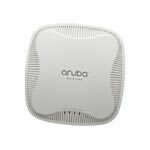 To see all of our available Open Box products and other deals, visit our Clearance Center!Multifunctional and affordable Aruba 103 series wireless access points (APs) maximize mobile device performance in medium-density Wi-Fi environments while minimizing interference from cellular networks. These compact and cost-effective APs deliver wireless data rates up to 300 Mbps per radio employing 802.11n technology with two spatial MIMO streams. Aruba's Advanced Cellular Coexistence (ACC) feature enables WLANs to perform at peak efficiency by minimizing interference from 3G/4G LTE networks, distributed antenna systems and commercial small cell/femtocell equipment. To eliminate sticky client behavior while users roam, the Aruba 103 series APs feature Aruba's ClientMatch technology, which continuously gathers session performance metrics from mobile devices. If a mobile device moves away from an AP or if RF interference impedes performance, ClientMatch automatically steers the device to a better AP. Aruba 103 series APs additionally support priority handling and policy enforcement for individual Microsoft Lync media on the same device, including encrypted videoconferencing, voice, chat and desktop sharing.